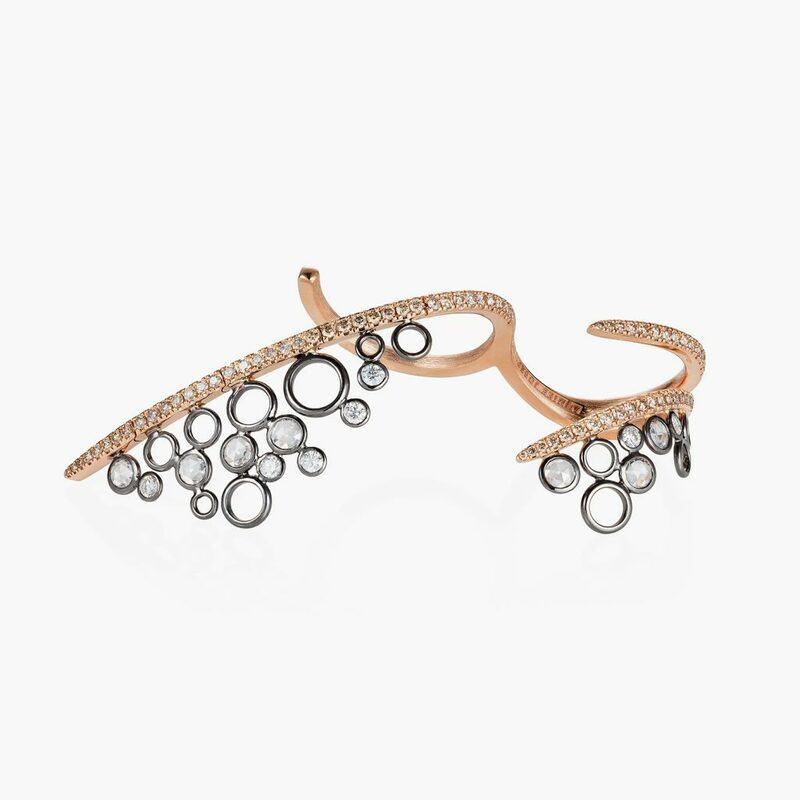 Ornate and bold, this contemporary ring curls effortlessly around your finger. It would be almost impossible to get unnoticed. Rendered in 18K rose and black gold. Composition: White diamonds 0.45cts & Brown diamonds 0.88cts. 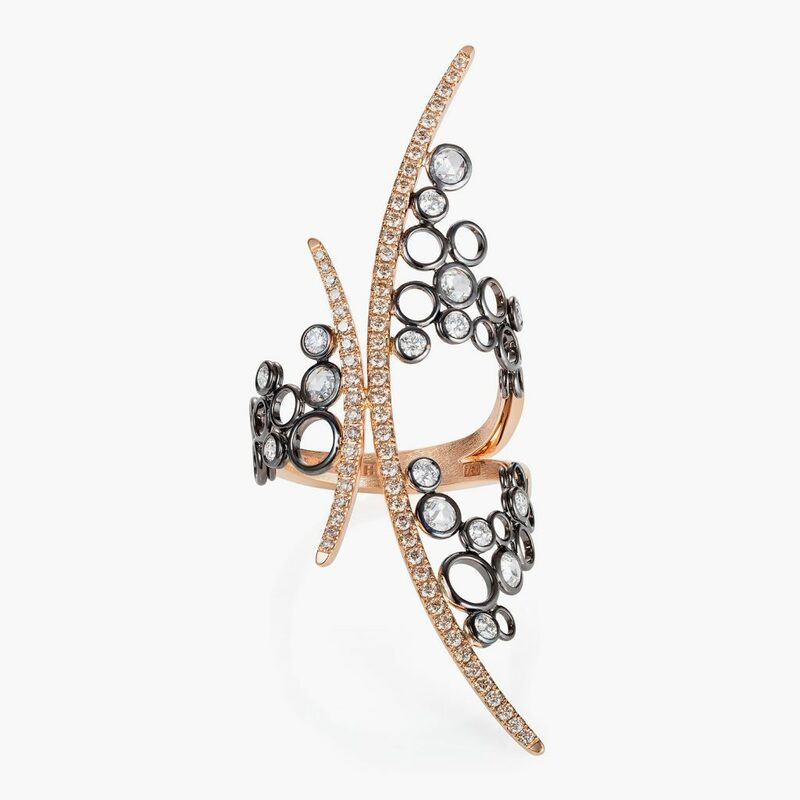 Expertly hand crafted from 18K rose and black gold with white diamonds. Designed to sit across two fingers. Its simple yet elegant design will make it your everyday go-to ring. Composition: White diamonds 0.58cts & Brown diamonds 0.87cts. 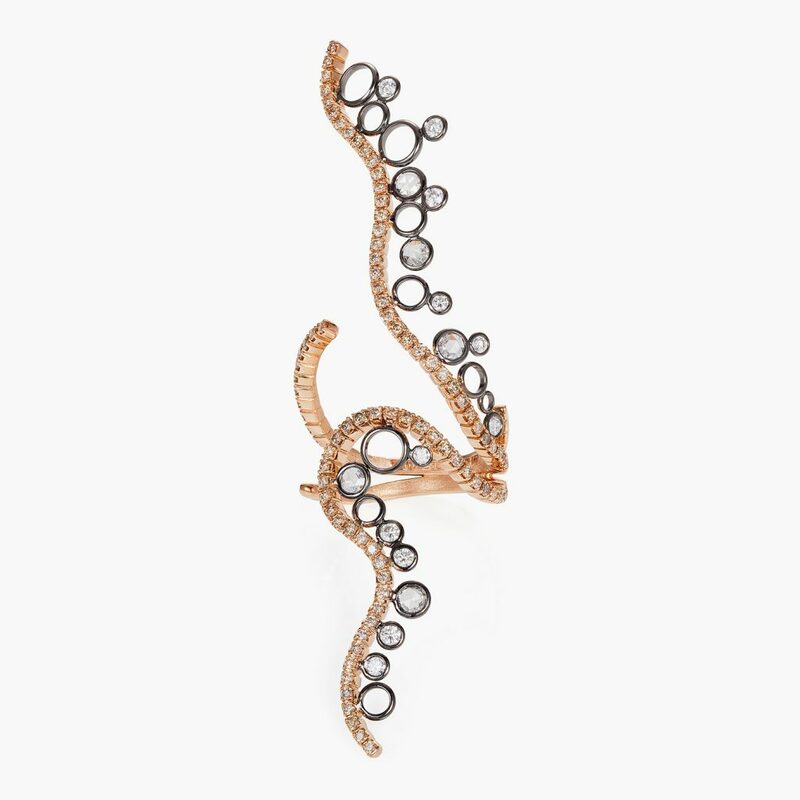 This sumptuous 18K rose and black gold ring features a slim silhouette and diamond encrusted bubbles for dose of contemporary polish. Composition: White diamonds 0.46cts & Brown diamonds 0.73cts. 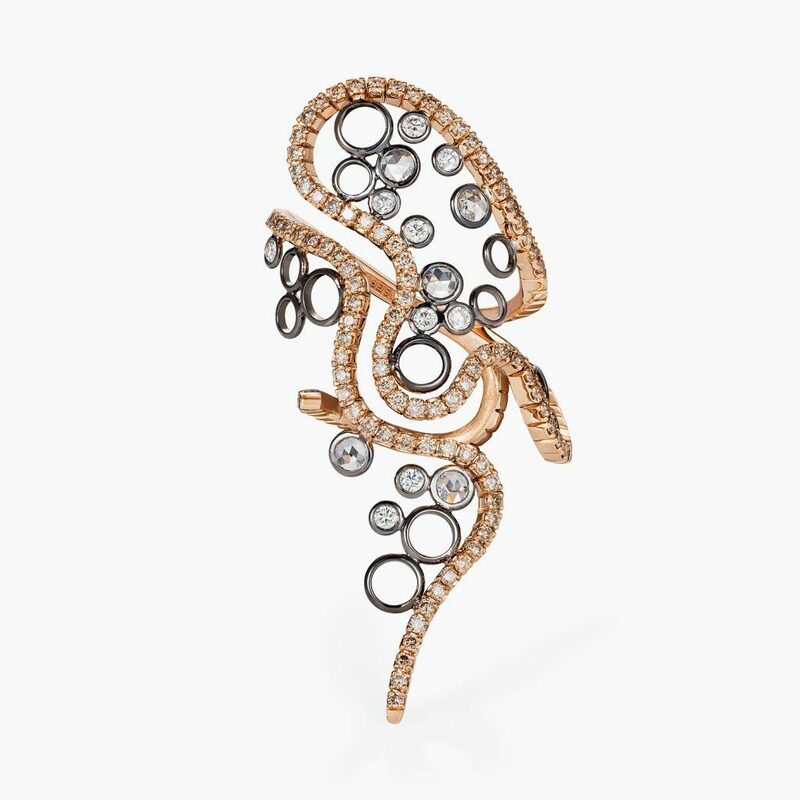 Immaculately crafted from 18K rose and black gold, this striking ring detailed with alluring cutout circles and diamonds will add a brilliant dose of sparkle to any outfit. Composition: White diamonds 0.46cts & Brown diamonds 0.44cts. 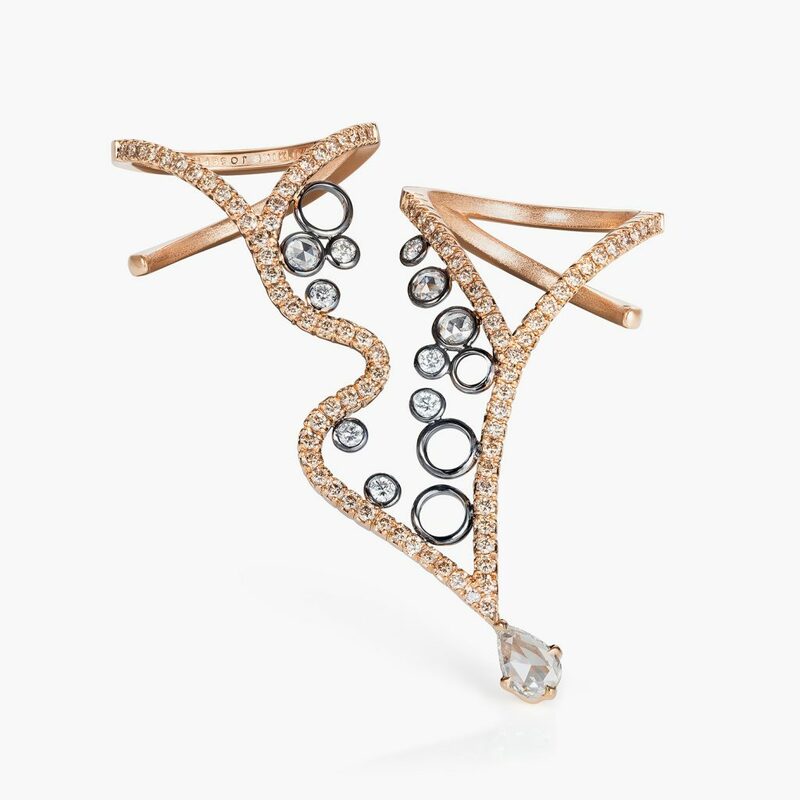 This modernist double finger rings crafted from 18K rose and black gold and accented with white diamonds for heightened sense of glamour. Composition: White diamonds 0.56cts & Brown diamonds 0.52cts. 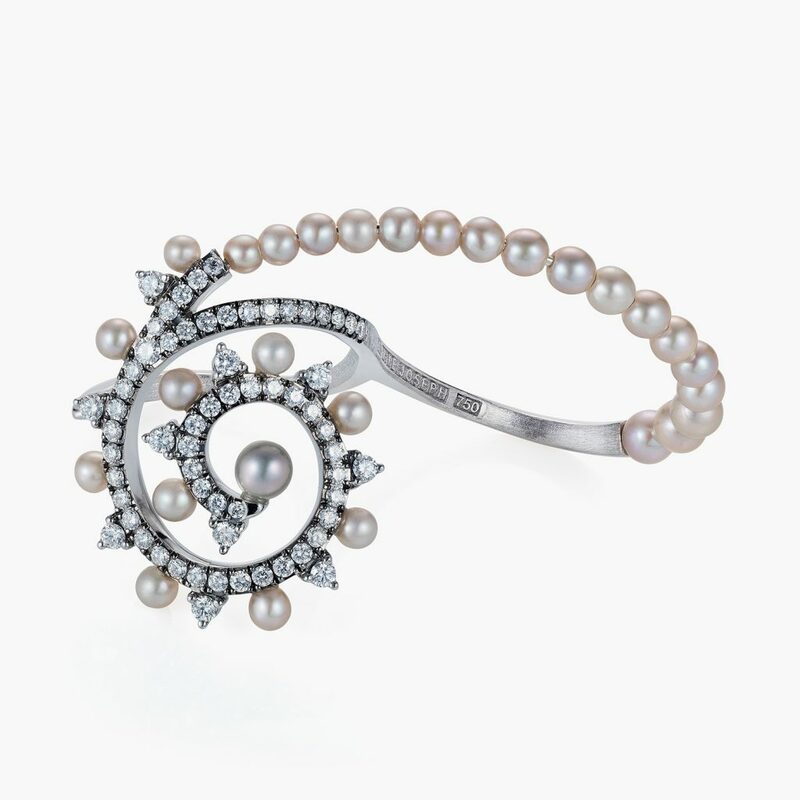 Combination of whimsical and classical designs create this fascinating white diamond and grey pearls two fingers ring. Rendered in 18K white gold. Composition: White diamonds 0.56cts & 28 grey pearls. 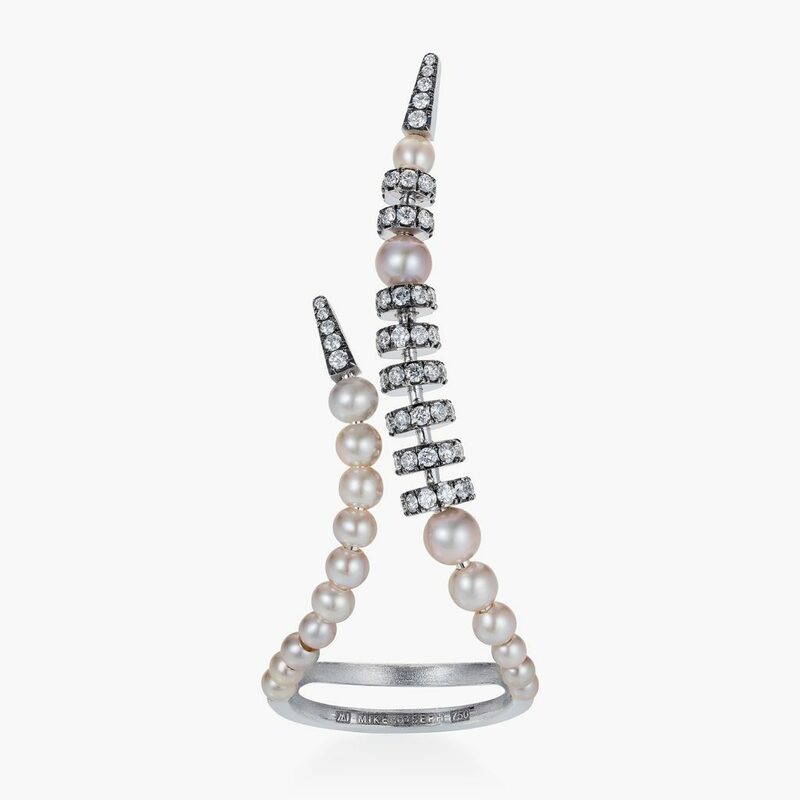 Stunning wrap around design covers the entire finger with tiny grey pearls. 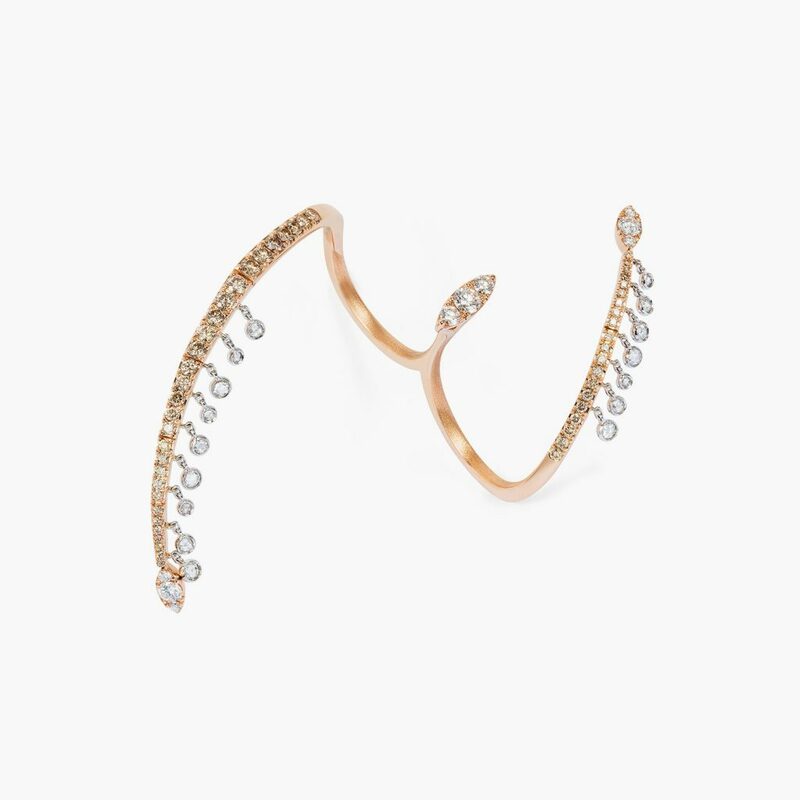 This ring is designed to complement a woman’s personal style, rather than define it. 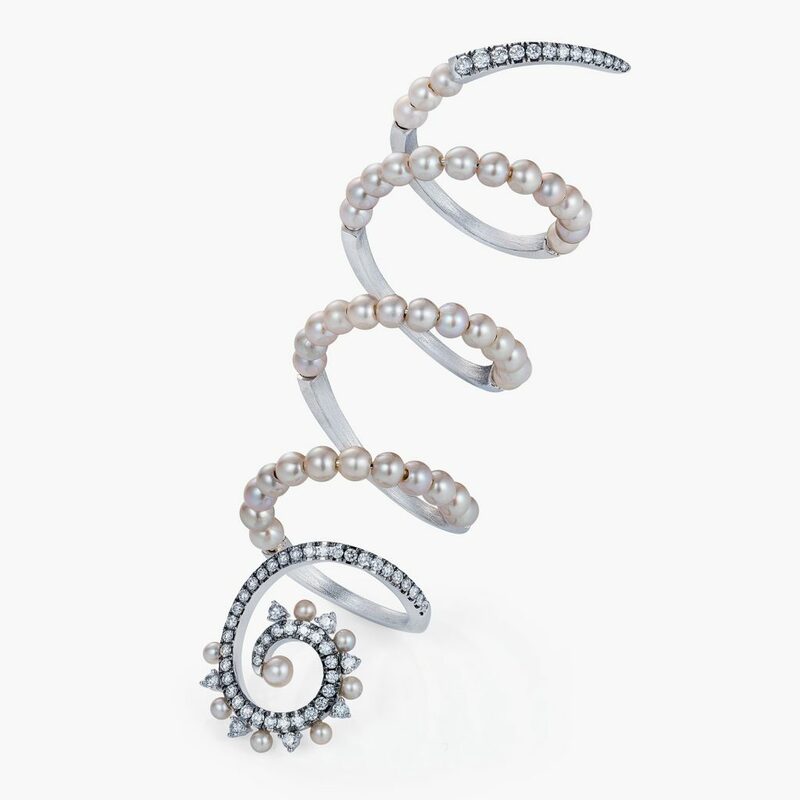 Composition: White diamonds 0.54cts & 49 grey pearls. 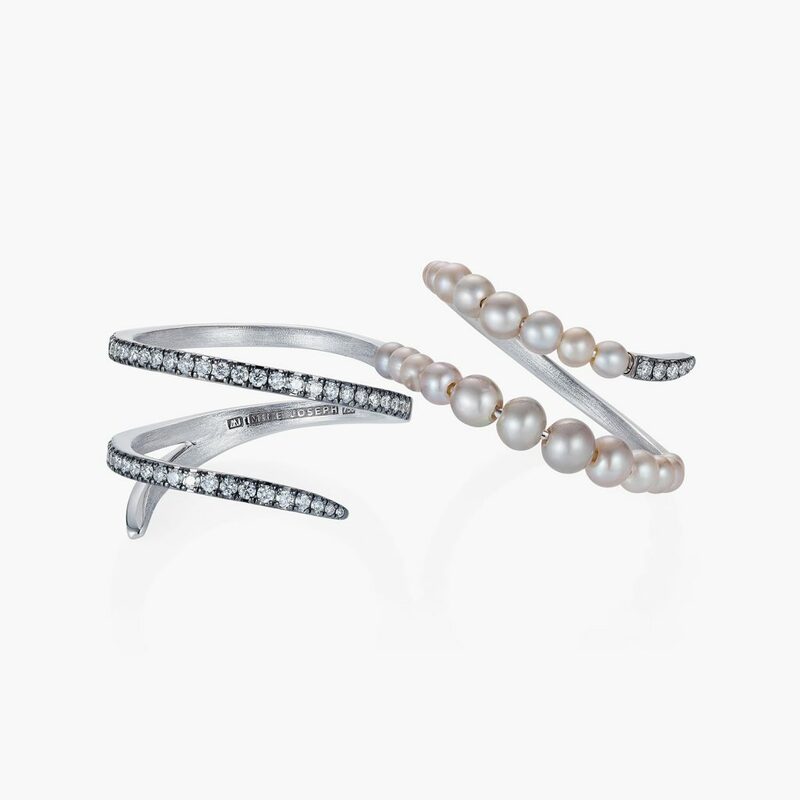 Expertly crafted from 18K white gold with white diamonds and grey pearls. Designed to sit across two fingers. Its simple yet elegant design will make it your everyday go-to ring. 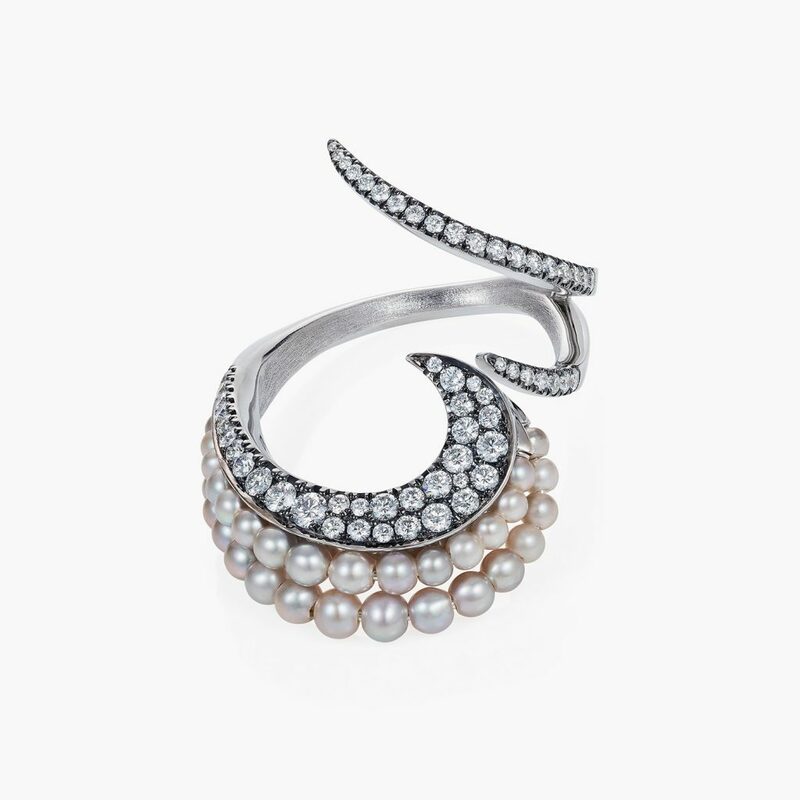 Composition: White diamonds 0.34cts & 21 grey pearls. Ornate and bold, this contemporary ring curls effortlessly around your manicured finger for a touch of glamour. Composition: White diamonds 0.64cts & 33 grey pearls. Bring some intrigue as well as edgy beauty into your life with this mesmerizing combination of white diamond and grey pearls. Composition: White diamonds 0.74cts &18 grey pearls. 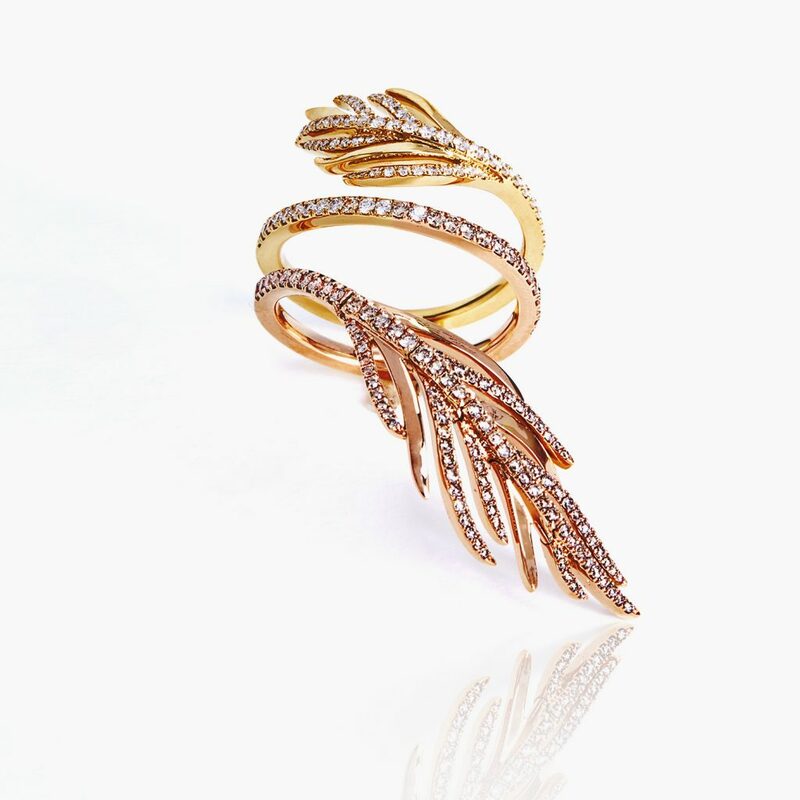 Wrapping elegantly around the finger, the gold Feather ring transforms from pink gold into yellow, sweeping over the top of the hand with the sparkle of brown and white diamonds. 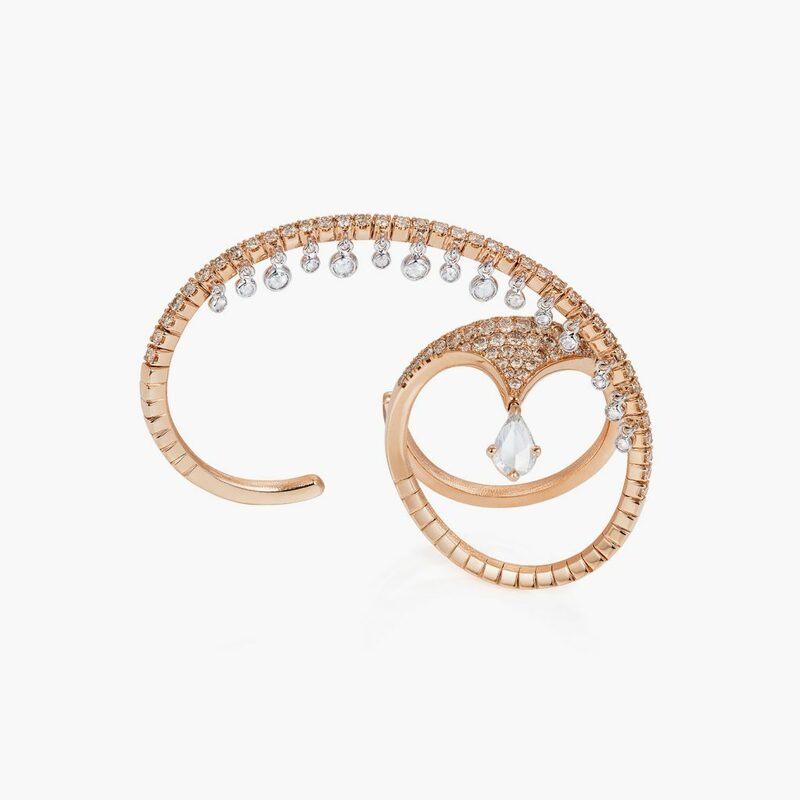 Crossing over the finger to wrap around the other, this waterfall ring is a dazzling fusion of rose and white gold. Sparkling like a tiny water droplets, white diamonds twinkle from the ring as it traces the fingers, while a marquise shape center diamond rests teasingly on the skin. Rendered in 18K white & rose gold. Composition: White diamonds 0.58cts & brown diamond 0.68cts. Composition: White diamonds 0.37ts & brown diamond 0.81cts.